Welcome to my free guide on how to use evernote to help you get fit. Use the table of contents below to skip around to different sections. In a nutshell, Evernote is software that organizes your thoughts, lists, photos, websites, emails, recipes and more. If you have never used it and you start using it, you’ll wonder how you ever went without it. The real beauty of Evernote is that once you put all those things in it, you can easily access them across all your devices such as your smartphone, laptop, computer and tablet. What that means is you can write out your grocery list on your laptop and easily read that same grocery list on your smartphone after you arrive at the grocery store. If that wasn’t great enough, its also free, though there is a premium version that can be purchased. 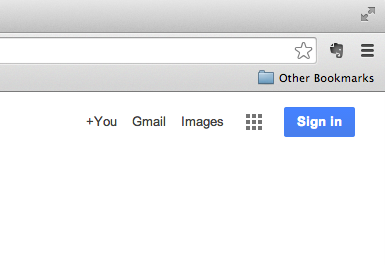 For the Mac and Windows versions, just type “download evernote” into google and click on the first result. Your download should start automatically. Note for mac users. I do not recommend getting the app version for mac computers from the Mac app store. If you are a mac user, download evernote directly from evernote as mentioned above. I’ve used the mac app version and found it to have bugs. Once you get evernote installed and opened, it will ask you to either sign in or create a new account. After you create an account the app will open. Below is a screenshot of the main evernote window. I’ll reference each number in the image above. Notes are the main holders of all your data. Everything you enter into Evernote is put into a note. To give an analogy to the real world you can think of a note as a piece of paper with something written on it. To create a new note, first click on the notebook that you want your new note to be in, then click the “new note” button. Note: If you have a notebook called “food” and you click on that notebook first, the button to create a new note in that notebook will show as “new note in food”. Notebooks are what you use to organize all your notes. You can place notes inside different notebooks. To make an analogy to the real world, a notebook is like a folder inside a filing cabinet where you can place all your various notes. To create a new notebook, click on “notebooks” on the left side and then click on the “new notebook” button. This area lists your various notes. This area shows what is inside each note. This is also where you can add things to your note such as text or photos. Stacks allow you to group similar notebooks together for even more powerful organization. For example, let’s say you have one notebook called food, one called recipes and one called food photos. Since “food” could entail both recipes and food photos, you could stack the recipe and food photo notebooks underneath the food notebook. Here is how you would create the stack just mentioned. Create two notebooks and name them “recipes” and “food photos”. Right click (control click on Mac) on the “food photos” notebook and highlight “add to stack” and then click “new stack”. 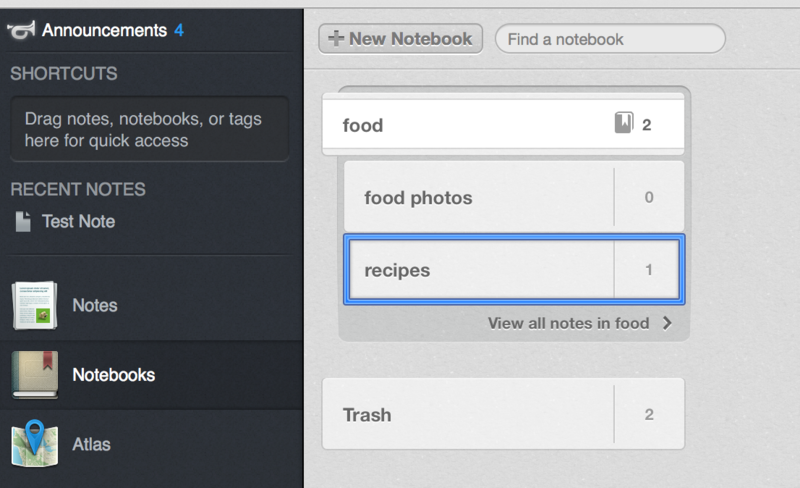 You’ll see a new stack named “notebook stack” appear above the “food photos” notebook. Right click the “notebook stack” and click “rename stack”. Rename the stack “food”. Now if you double click on the “food” stack you will see the “food photos” notebook underneath it. To add the recipes notebook to the food stack, all you need to do is drag it to the food stack. You can see an image of how it would look below. Alternately you can create a stack by dragging one notebook on top of another one. This will create a new stack which you can then rename. When you first start using evernote, it gives you a default notebook to use called “first notebook”. Until you create a new notebook, all new notes you create will be placed in this notebook. In addition any emails that you forward to evernote will be placed in this notebook unless you specify otherwise. We will talk about how to forward email a little later. If you want to change the name of your default notebook you can. Just right click on it and choose “rename notebook”. Tags are what some consider to be the real power of evernote. For those with a large number of notes, tags add yet another powerful organizing tool. Tags are completely optional, and may not be necessary for those that don’t have large numbers of notes. For those that think they may want to use tags, let’s dive in. Let’s say you have notebook called “great recipes” and within that notebook you have thirty different notes. These thirty notes each contain a different recipe. Now let’s say ten of these thirty notes contain recipes that involve chicken. For these ten notes that contain chicken recipes, you could add the tag “chicken”. Now if you search evernote for the tag “chicken” it will only show you those recipes that have the “chicken” tag that you added. To add a tag to note first create a new note or open an existing note. Then click in the “click to add tags” area above the note editor and enter in your tag. See image below. You can enter one tag or multiple tags if you wish. For example, if you have a note that contains a recipe for microwavable veggies, you might add the tags “microwave” and “veggies”. That way you can find this recipe later by searching either for the “microwave” tag or the “veggies” tag or you can immediately find the note by searching for both of those tags. After entering the tags you want to search for hit enter. This will bring up all the notes that have those tags. Tags can be a huge help for locating notes, but if you have too many tags it can get hard to sort through them or remember them all. If you tag every note with a different tag the number of tags you have could start to get out of hand. Multiple word tags could be more difficult to remember down the line. If you want to use a multiple word tag, you can add two tags instead. For example, rather than tagging a photo of a recipe with “#honey chicken” you could tag it with two tags of #honey and #chicken. This way you can later find that photo with either the chicken tag or the honey tag if you remember that the recipe is a chicken recipe or if you remember that the recipe has honey in it. If you remember that the recipe has both chicken and honey you can search for both of those tags. One powerful feature Evernote has is the ability to organize email. If you have an email that you want to save and be able to quickly find later on, you can forward that email to evernote and evernote will store if for you as a note. There are a few ways you can do this. First you need to find your evernote email address. You can find this by clicking “Evernote” in the top left area and then clicking “account info”. Your evernote email address will be shown underneath “email notes to”. Next it’s a good idea to add your evernote email address to your contacts list in your email client. You don’t have to do this, but it will save you a few steps as you will see in the next step. To send an email to a new note in your default notebook, open the email in your email client and click the forward button. The subject line of the email will be the title of the note. The recipient of this forwarded email is going to be your evernote email address. If you have already put your evernote email address in your contacts list, then you only need to type the first few characters of your evernote email in the “to:” field of the email and the rest should auto fill. Otherwise you need to copy your evernote email address and paste it into the “to:” field of the email. Then all you need to do is send the email. The email will become a new note in evernote in your default notebook. The title of the note will be the subject line you chose for the email. While this is helpful for organizing email just as it is, you can increase the level of organization even more. For one, you can create a specific notebook for your emails and forward those emails to that specific notebook. To do this, you first need to create the notebook in evernote. Let’s say you create a new notebook and call it fit101. Now if you receive a newsletter email from me and want to save it (because they are all invaluable :o) ) , you can forward that email to your fit101 notebook in evernote. Here’s how you would do that. You specify the notebook you want the email to go into by putting the “@” symbol followed by the notebook name, and that all goes after the subject line. There is yet another level of organization when it comes to organizing email in evernote. If you want you can add tags to the email when you forward it. When the email is sent to evernote, it is tagged with those tags. This gives you another tool for finding the email within evernote later one. Here is how you would do this. An app such as evernote wouldn’t be very useful without a way to search your notes. Fortunately evernote has a very effective search box. Let’s go through all the ways you can use the search box to search, starting simple and moving to more advanced ways. will return only notes that have both the word “chicken” and the word “recipe”. Evernote has several operators you can insert into your search query to narrow your search results. Here are some of the more common ones. will return all notes that have the term “chicken” as well as all notes that have the term “recipe”. will return all notes that have both the “chicken” tag as well as the “recipe” tag. The created operator allows you to search notes within a certain time frame. Let me show you some search examples and then I will explain them. This will search for the term “chicken” in all notes that were created today or yesterday. You can change the number (in this case 1) to a larger number to search further back. This will search for the term “chicken” in all notes that were created this year or last year. Again you can increase this number to go back further. You can use the modifiers “month” and “week” in the same way that day and year are used above. This will search for the term “chicken” in all notes that were created on or after July 4, 2010. This will search for the term “chicken” in all notes that were created before July 4, 2010. As you can see evernote gives you a lot of options for modifying your search according to time. This can help when you can’t find exactly what you want but you know the time frame in which it was created. Of all of the many evernote features, web clipper may be the most useful. Web clipper is a tool that allows you to save complete web pages as notes to evernote. Web clipper is similar to bookmarking a site but far more powerful. With web clipper, web pages can be saved as notes in evernote to be tagged, stored in notebooks or both. By using notebooks and tagging, web pages can be easily recalled later on. In addition you can add your own comments to the web pages that you save. Web clipper is similar to bookmarking websites, yet far more powerful. To install web clipper, go to https://evernote.com/webclipper and click the button to download it for your web browser. When it finishes installing you may need to restart your web browser. After restarting your web browser you should see a new elephant symbol in the top right hand area. That is the web clipper button. See image. To go ahead and practice, open a web browser, go to any web page and click the elephant button in the top right hand corner. This will open up the web clipper window. See image below. You have several options for saving. Let’s go over each. If you click on the article option, evernote will save only the body of the web page. Areas such as the side bar that often contain ads and other parts unrelated to the main article will not be saved. When you select the simplified article option, evernote attempts to capture only the content and nothing else. 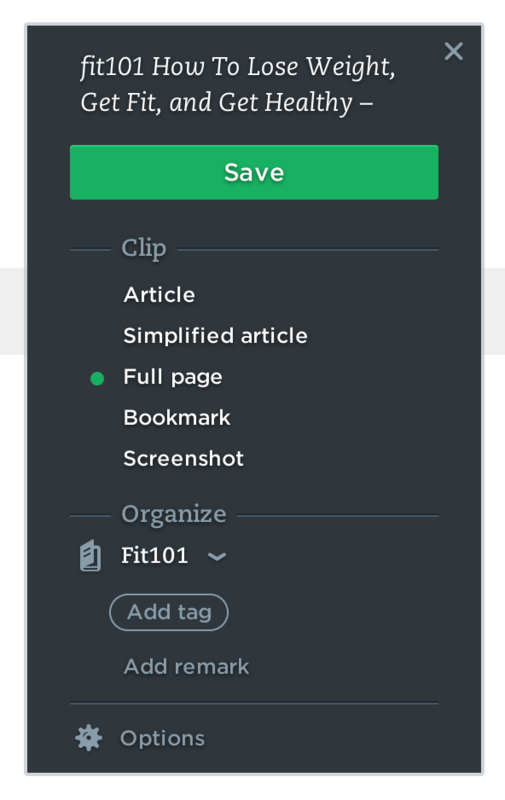 The best way to see how this works is to save a web page using this option and compare it to the original as well as one you saved using the “article” option. This option does what it sounds like. It saves the entire page – ads, sidebar and everything else. Choosing this option saves the title of the web page, a small image, and a small snippet only. As with the full page option, this option does what it sounds like. It takes either a full screen shot of the entire page, or you can take a partial screenshot. To take a screenshot of the entire page, choose the screenshot option and click the screen without using the cross hairs to select a certain region. After you take the screen shot you have the option to use evernotes markup tools to add various markers to the screenshot such as arrows, text and highlighting. These tools are located under “annotate”. See screenshot. Next you will want to choose the folder to store this note. You can select your folder underneath “organize”. If you want to add tags to this note click the “add tag” button, type in your tag and hit enter. You will see the tag appear beneath where you typed it. To add another just type in your second tag and hit enter. If you want to add a remark to this note, click the “add remark” button and enter your remark. When you are finished click the “save” button and the web page will be saved to evernote as a new note. If you want to view your new note in evernote right away you will want to click the “sync” button so that evernote can sync with webclipper. See image below. If you use Chrome, Safari or Opera you can save entire PDF’s that you open on the web. When the page you open is a PDF, you will see the PDF option as the first option and it will already be selected. Just add any tags or remarks you want as mentioned and click the save button. If you want you can save only a selected portion of a page to evernote. To do this first highlight the part of the page you want to save and click the elephant button. You will see that “selection” is available and is already selected. Enter any tags and remarks you may want and click the save button. As mentioned the beauty of evernote is that no matter which device you are on, you always have access to your notes. If you create a new note on your laptop at home you can leave the house and access it on your smartphone. Synchronization happens by default about every 15 or 30 minutes. If you need to sync more often you can manually sync at any time. Keep in mind that if you make a new note on your laptop and want to access it on your smartphone right away, you’ll need to manually sync on both devices in order to see it. Whenever a sync is done, your data gets synchronized to evernote’s servers as well. More simply put, your evernote data is stored in the cloud. Even if your data becomes corrupted on your own laptop or desktop, you can always install a new copy and retrieve all your data from evernote’s servers. It is highly unlikely that your data would ever be completely lost. Evernote is a huge company and I would guess the odds of them losing people’s data are on par with the odds of Google losing people’s gmail data. However if that is not enough security for you it is fairly simple to back up your notes to your own computer. Here is how to do this. Open evernote on your laptop or your desktop and click on “notebooks” on the left hand side. This will display all the notes that you have. Right click anywhere in the notebook list area, so long as you are not clicking on one of your actual notebooks. In other words find some empty space and right click. This will bring some additional options. Click on “export all notes”. Choose a title for your exported file and where you want to this file to go. Keep the format as it is and click the “save” button. Now if you install a new copy of evernote on your laptop or desktop, you can restore this back up. To do this open evernote and click on “file” and “import notes”. Then find and select your backup file and click “open”. It will ask if you want to place your notes in a synchronized notebook. If you want these notes to be saved to the cloud (which you probably do) then click yes. The downside to this manual back up method is that this does not restore the notebooks you made. It restores all of your notes with their tags, but restores them all into one new notebook , rather than restoring everything the way it was, with all your notebooks containing your notes. So technically all your data is there, but it is not organized into the individual notebooks that you may have made. Note: the above locations are not for the Mac App store version of evernote because the database is difficult to find in that version. Make a backup of those files, and when you reinstall evernote you should technically be able to get everything back the way it was by restoring the files in the proper location. I should state that this last form of back up is for the technically savvy computer user. No matter where you are, if you have access to a computer and the web, you can get access to your notes even if you are not on your own computer. To do this all you need to do is go to www.evernote.com. In the top right hand side click on the menu icon and click “sign in”. You can do everything in the web interface that you can do elsewhere. However I find the web interface is not quite as slick and easy to use as the downloadable version. Evernote has a free version as well as a paid version. Which one you use will be based on what your needs are. Let’s take a look at the differences. Every time a note is edited and synced the data is backed up to the evernote cloud. That transfer of data counts towards your monthly data quota. The free version has a limit of 60 megs per month. If you don’t save a lot of photos or other large files this may not be an issue. Personally I don’t come close to touching my 60 meg monthly quota. If 60 is not enough the premium version upgrades you to a 1 gig per month limit. The free version allows the size of a note to be as large as 25 megs while the premium version increases this to 100 megs per note. Both the free and paid version have a limit of 250 notebooks total. What that means is you don’t want to go overboard making them – for example making one notebook for just a couple of notes. The free version allows up to 50 emails to be sent to your account per day. The paid version increases this limit to 200 per day. As far as I can tell, there is no technical support for the free version. The reason I say this is because the mac app store version that I was using became corrupted, and when I sent in a ticket the response I got ( about 10 days later ) was that they couldn’t help me. I had to figure it out on my own. If you upgrade to the premium version you do get technical support and the response is probably much faster. I should mention that there is a support forum where anyone can ask questions no matter what version you have. However anyone who volunteers to help on this forum is just that – a volunteer. Premium members can add a passcode lock to their tablet and smartphone evernote account. With this feature, people that don’t have the passcode cannot access your notes on your tablet or smartphone. Now that you know how to use evernote, let’s get into the part of this guide that ties into losing weight and getting fit. Here are a few different ways that evernote can help you get fit. This is one of the most common uses of evernote. Create your grocery shopping list at home on your desktop, laptop or tablet and save it. Then pull that same note up on your smartphone when you arrive at the grocery store. While browsing youtube you find a cardio workout that you think you want to start doing. 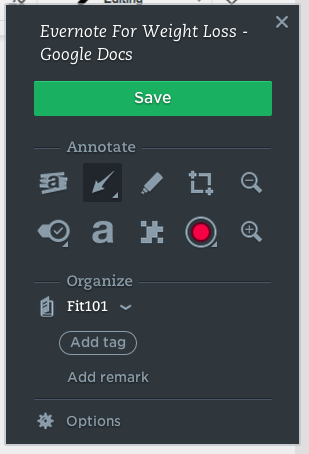 Create a tag in evernote and call it “keeping fit”. Create a notebook and call it “workouts”. Go back to the video on youtube and click the elephant button in the top right corner (the web clipper button). Next choose the “bookmark” option. Under “organize” select the “keeping fit” notebook, then add the “workout” tag and in the remarks text field type “this is a good workout for cardio”. Lastly click the “save” button. and press enter. Evernote will show you all the notes you have with the “workout” tag, including the cardio workout that you saved from you tube. Once you find that note just click on the link to the video that is in the note, and it will take you to that video on youtube. By recording your progress, you give yourself positive reinforcement, and the positive reinforcement gives you added motivation to continue moving forward. Here is an example of how this can be put into practice. On the day that you start your journey, create a notebook and call it something like “health” and in that notebook create a new note and call it “measurements”. Create a tag and call it “measurements” and add this tag if you want. Use this note to track your progess. You could enter a new entry once a month or once a week if you prefer. Always put the full date to help you track progress. Have a note where you input your short term as well as your long term goals. This way you can refer back to it often as a reminder of what you are shooting for. When you find a recipe you on the web that you like, you can copy and paste it into a note, or you can use the web clipper to save it to a note. Here’s an example. Create a notebook and call it “recipes”. Let’s say you find a recipe for chicken and broccoli that you would like to save. Click the elephant in the top right corner. Under “clip” choose the “article” option. Under “organize” choose the “recipes” folder. If you want to add a tag, create a tag called “chicken” and a tag called “recipes”. Add both of those tags and add a remark if you want to, then click the “save” button. Free forums can be a great place to get motivation as well as useful tips. However you have to be careful because there is also lots of info that is incorrect. In any case, if you find a forum post that you like you could use web clipper to save it just as in the examples already mentioned. In this case you may want to create a notebook and call it “forum posts” and a tag called “forum”. Alternately you can copy the text of the forum post and paste it directly into a note. Photos can help you see how you are progressing as well as give you motivation and positive reinforcement. You could take a few photos of yourself in the mirror and store these photos in evernote as “before” photos, then perhaps take an additional photo each month. Here’s how this might be done in. So the email subject line means that a new note will be created with the subject line “My selfies at the beginning” and be put in the notebook “before and after pics” and the “selfies” tag will be added to this note. And there you have it. A full guide on how to use evernote as well as nine tips on using it to get fit. I use evernote so much, it’s almost become like my second brain. I really don’t know what I would do without it. If you’ve never used it perhaps it will become an important tool in your healthy living arsenal.